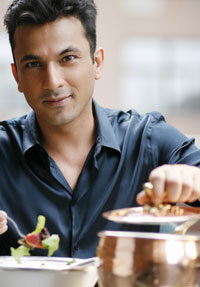 Sony Network TV Show "Andaaz"
New York, NY - Today, Sony TV's international show Andaaz announces its season 4 premier featuring the heartfelt story of celebrity chef Vikas Khanna. Khanna gives viewers the chance to see how you can start from rock bottom and rise to the top. His story is rare to come across giving viewers priceless advice on how to succeed. "Khanna shares an inspirational story that gives our viewers the opportunity to hear how success was achieved by a world famous personality," says Executive producer Sarika Batra of Andaaz." Khanna showcases how if you dream it, you can achieve it." The episode's theme is "building a new you.” Along with Khanna the show features weight loss expert Jay Piatek and New York's Tulsi restaurant's executive pastry chef, Surbhi Sahni. Both individuals offer advice that gives individuals confidence to go after their dreams. Piatek is the founder of the Piatek Institute in Indianapolis and has changed the lives of many through his weight loss advice. Sahni's culinary expertise showcases how you can make tasteful choices with tasty food. Khanna’s story of being homeless in NY, and still becoming a world-renowned chef offers inspiration while Piatek and Sahni offer tools to achieve your own success and happiness. The season premier of Andaaz is on Saturday February 16th at 6pm PST, and repeats 3 more times during the week. This season is highly anticipated worldwide.